In Matsuyama, the capital of haiku, material for your poetry is waiting around every corner. Use each of your senses to encapsulate them in haiku. 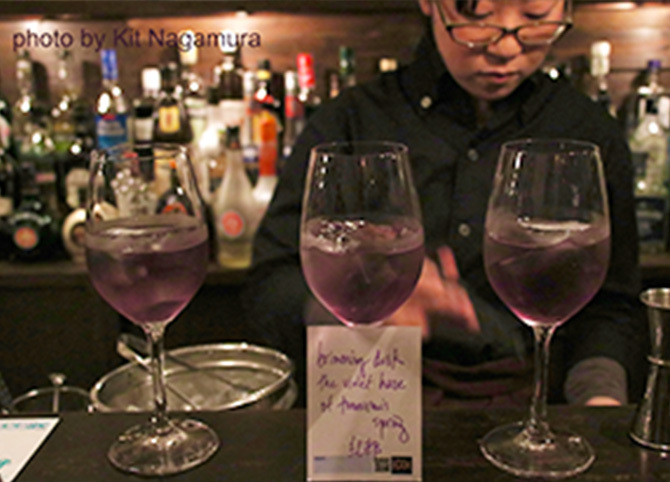 Enjoy your evenings at a haiku bar. Have fun reminiscing on your day. A home-from-home where people enjoy relaxing. There’s even an old book corner. The female bartender is a member of a jazz haiku group. 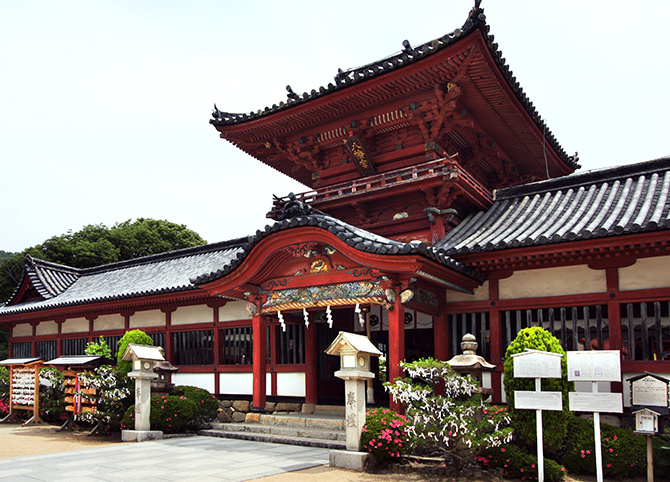 It was also used as a shooting location for a haiku drama. An establishment run by a jazz enthusiast. 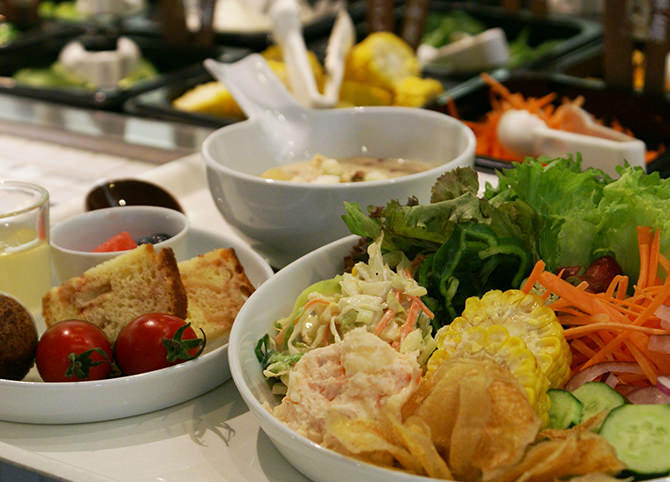 Let’s try some of the favorite food of Matsuyama natives and people who visit. 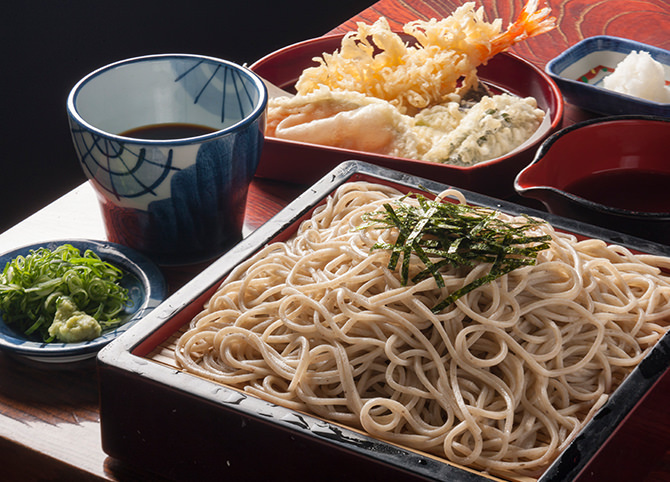 Since they were mentioned in Sōseki Natsume’s novel “Botchan”, they’ve been a local specialty of Matsuyama. 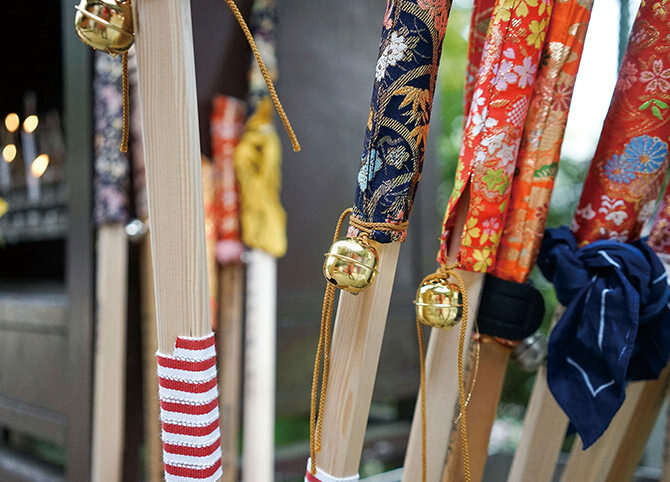 Three balls of mochi, flavoured with matcha, white bean, and red bean, are served on a stick. 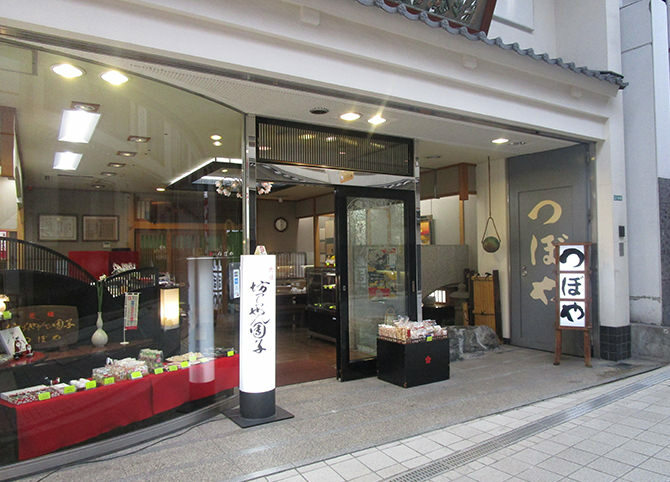 The original shop where Sōseki bought the dango when he visited the onsen. 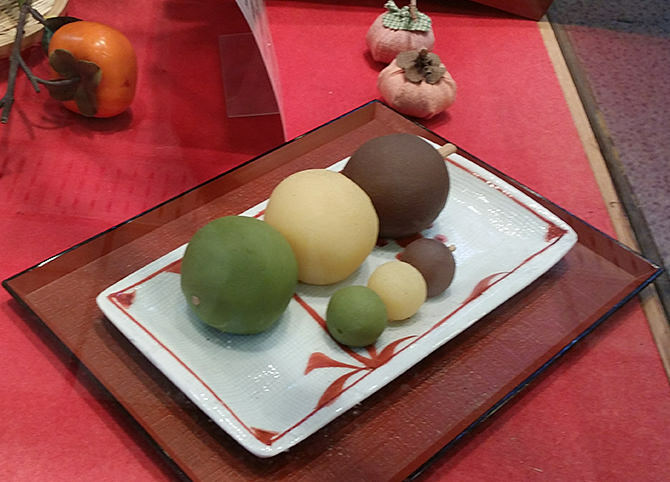 Jumbo-sized Botchan dango, enough to fill anyone. 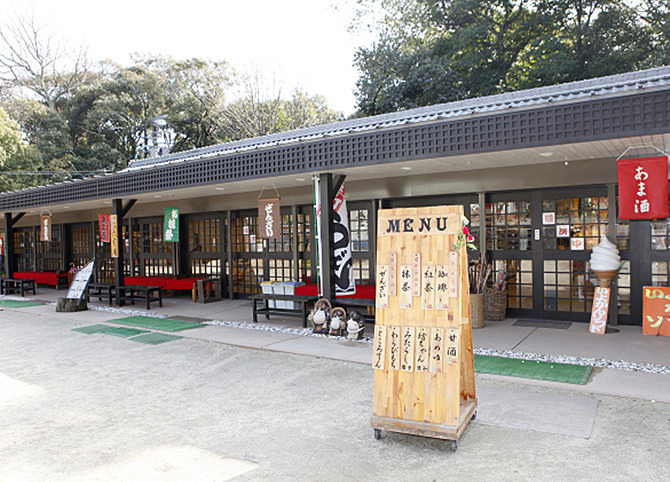 Chilled Botchan dango are served here. You can buy just one stick if you wish. 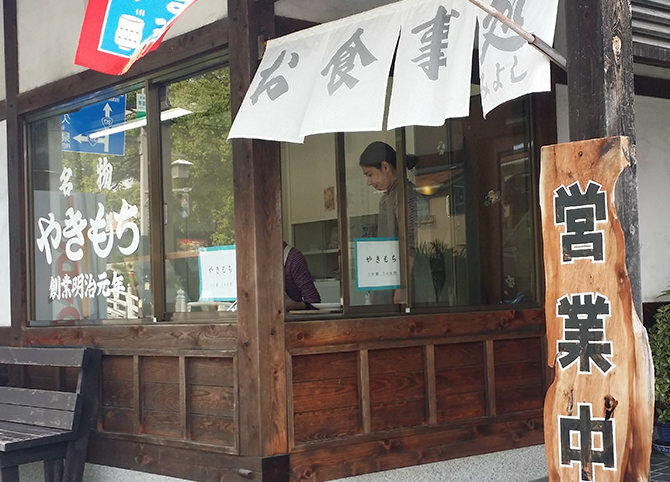 The Botchan dango served at Dōgo Onsen Honkan are made here. 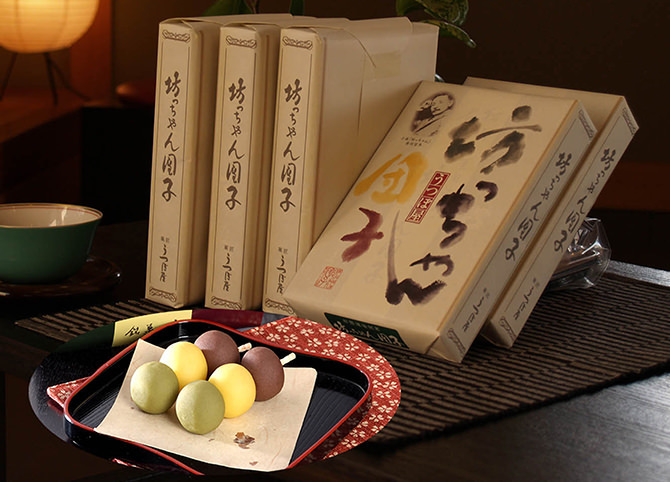 You can buy them at Iyotetsu Takashimaya, Matsuyama Mitsukoshi, Matsuyama Airport, Shikoku Kiosk and other outlets. 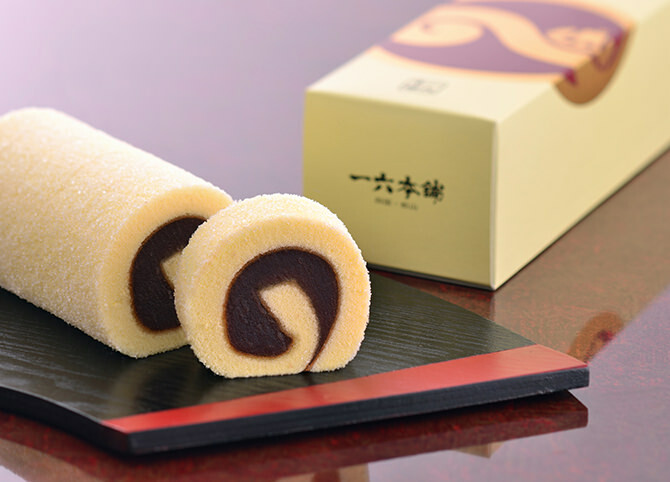 A Swiss roll filled with bean paste. In the Edo period, this cake was a favourite of lords of the domain. 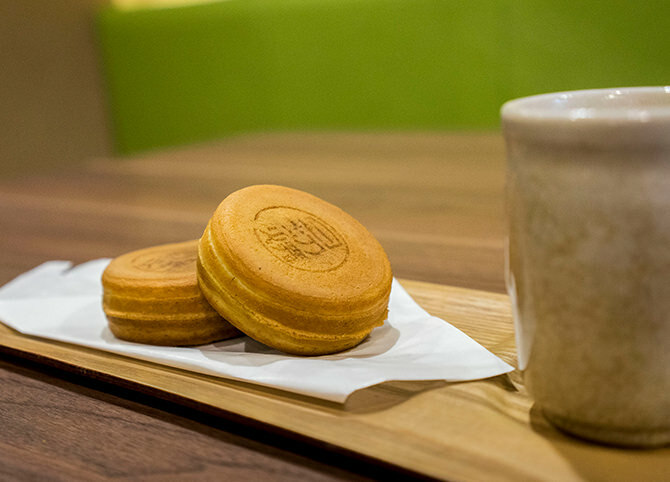 The taste of cakes made individually by artisans. 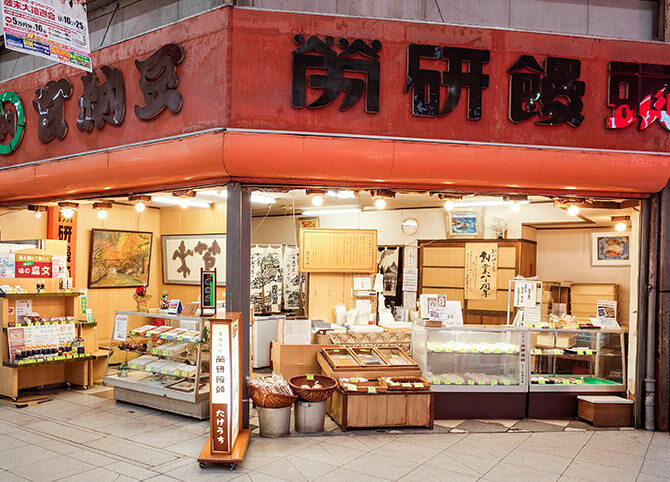 When the feudal lord of Matsuyama was serving in Nagasaki, he became fond of the foreign cakes he ate on a Portuguese merchant ship, and he brought the recipe back to Matsuyama. Shiki Masaoka was a gourmet who loved these buns. 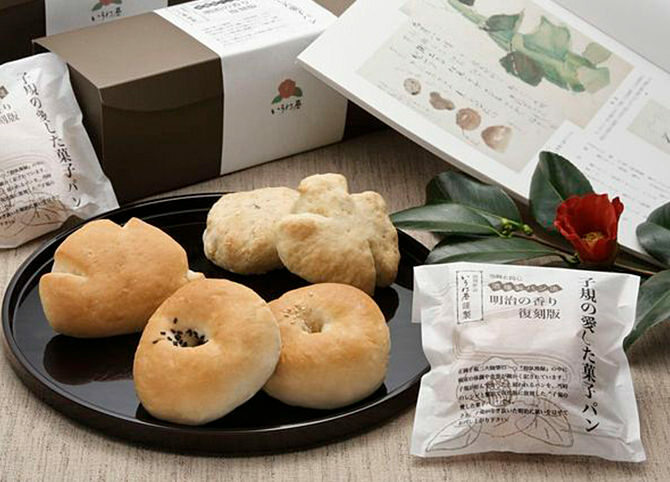 Buns from the Meiji period, which Shiki Masaoka enjoyed, have been recreated. These cakes were originally offered as alms to pilgrims. 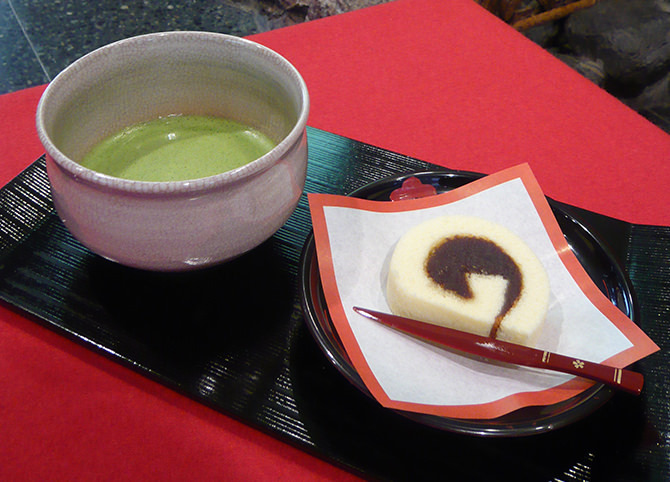 Eating oyaki is one of the pleasures of visiting Ishite-ji. 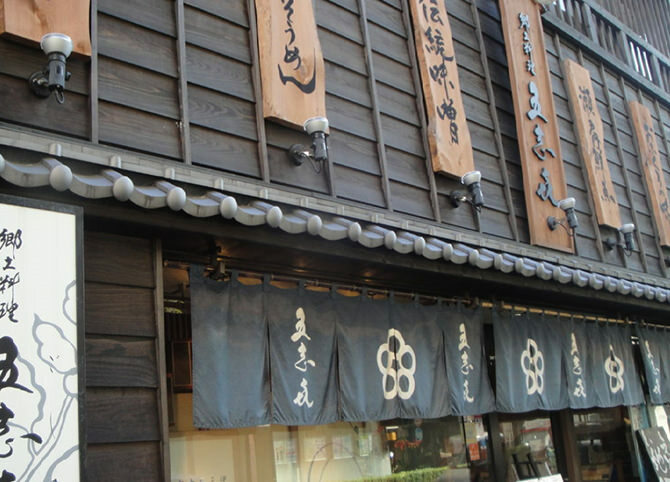 Established in 1869, this restaurant is in front of Ishite-ji Temple. 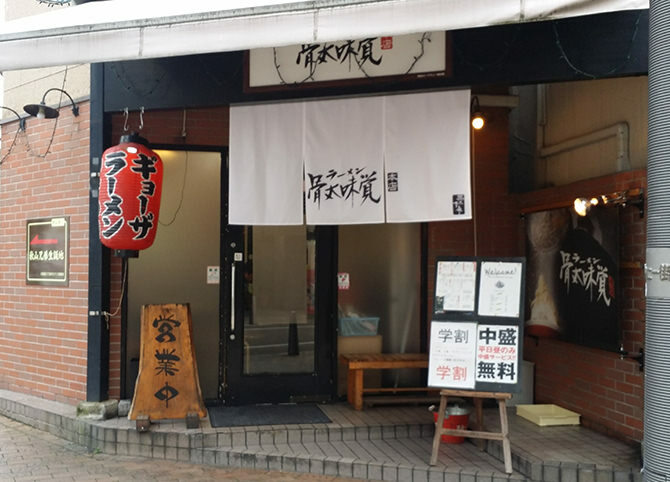 You can enjoy amazake and udon. When Natsume Sōseki came to Matsuyama, Masaoka Shiki’s mother welcomed him with this dish. An essential dish at any celebration in the region. 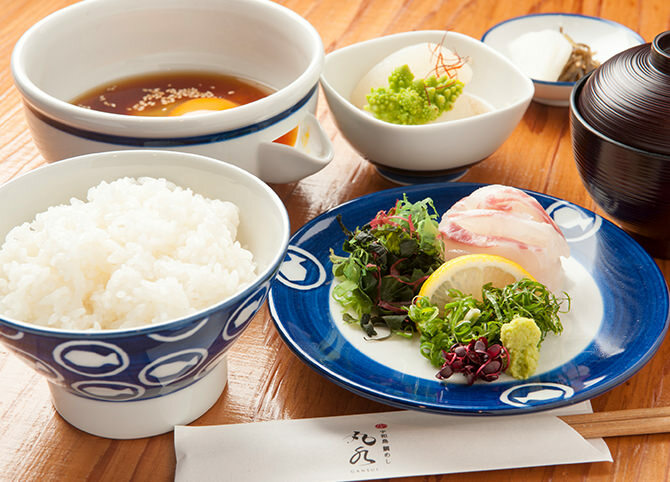 Sea bream rice, Ehime’s local specialty, comes in two forms – with a whole fish cooked with rice, and with sashimi. The sea bream rice and sea bream sōmen are popular. Enjoy sea bream with a secret sauce. Enjoy fillets of sea bream on rice with sauce. The seeds of haiku can be found all around town. 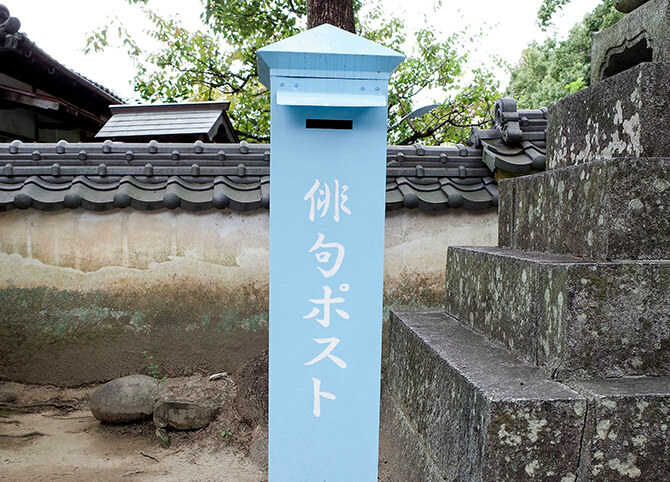 There are 92 Haiku Boxes around Matsuyama, where you can post your haiku. Every two months, the best Japanese haiku are presented on the Matsuyama City website and in the Ehime Shinbun newspaper. 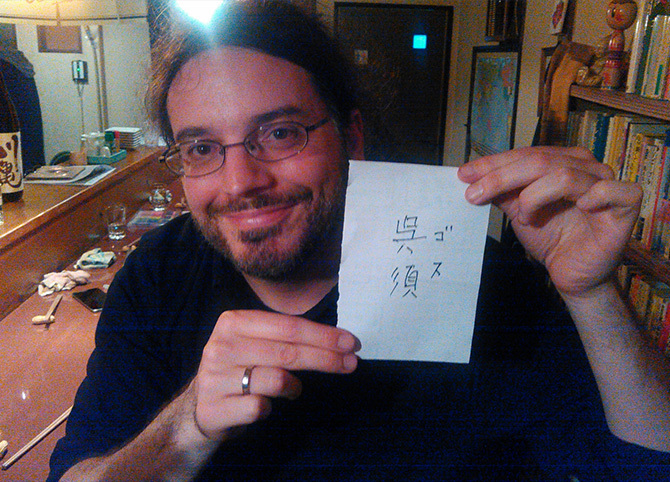 Haiku in foreign languages are selected once a year. A famous poem by haikuist Shiki Masaoka has become a Haiku Box. 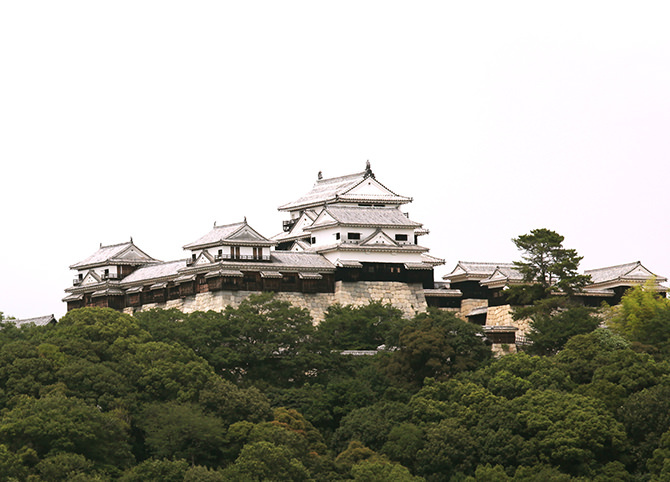 “Matsuyama castle, the keep is higher than the autumn sky” Shiki Masaoka. You can look down on Dōgo Onsen and the town from this hill. It’s a great place to take photos. 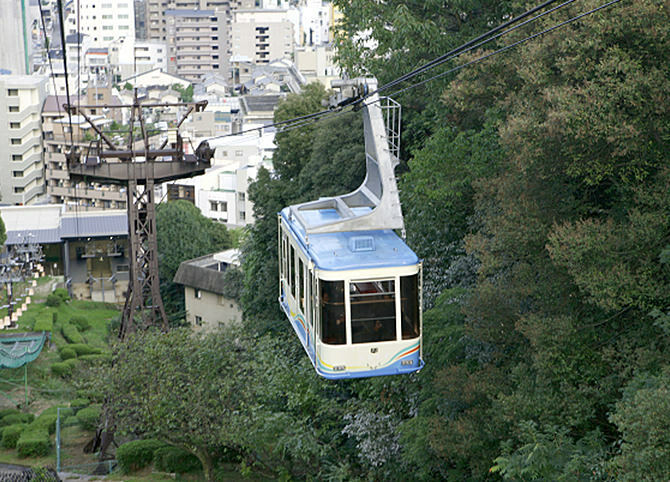 Enjoy riding the cable car or chairlift to the main enclosure of Matsuyama Castle, located at an elevation of 132 m.
If you listen carefully, the sound resonates in your heart. 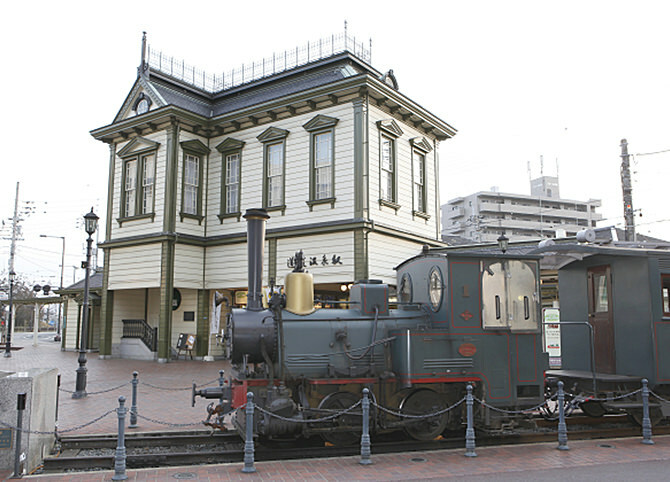 The Botchan train is a replica of the steam trains that ran in the Meiji period. 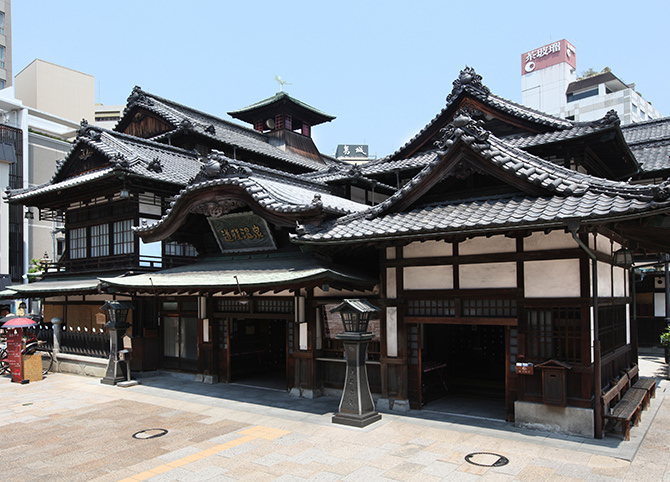 It sounds its whistle at Shieki, Matsuyama City Hall, and Dōgo Station. 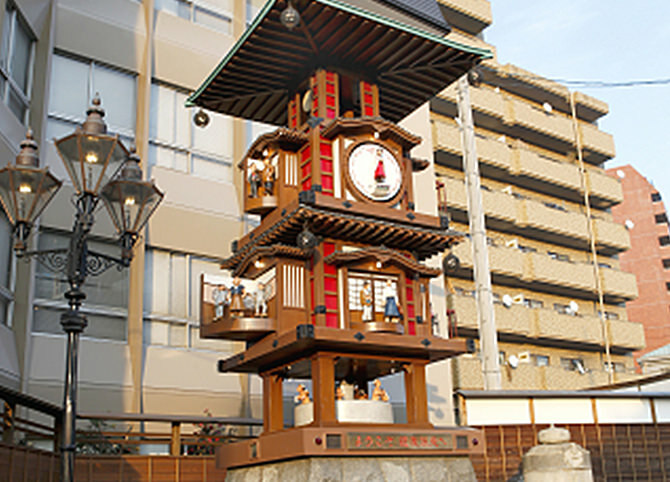 The time-keeping drum of Dōgo Onsen Honkan has been beaten continuously from 1894. 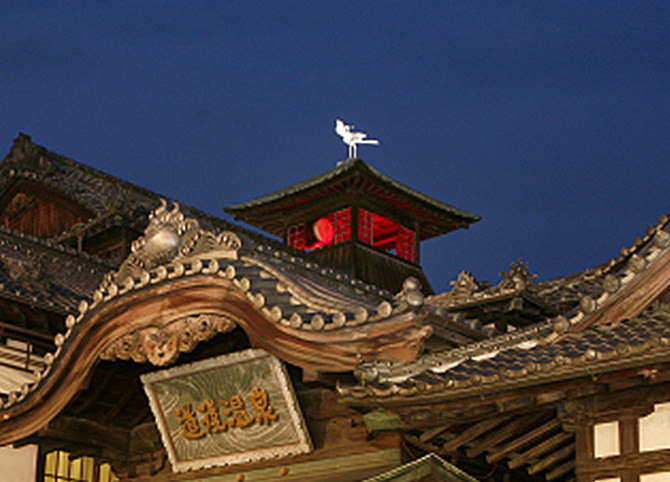 It’s been chosen as one of the 100 Soundscapes of Japan. You can hear it at 6 am, noon and 6 pm. 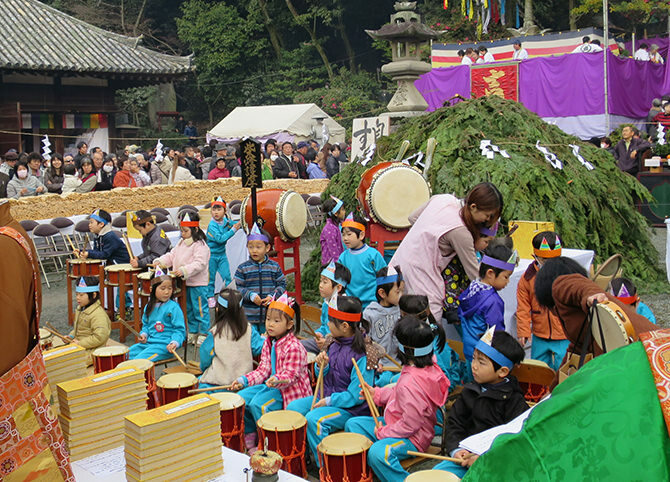 The characters of the novel Botchan appear, accompanied by a melody. The bells carried by pilgrims are used to drive off wild animals on the pilgrimage route. 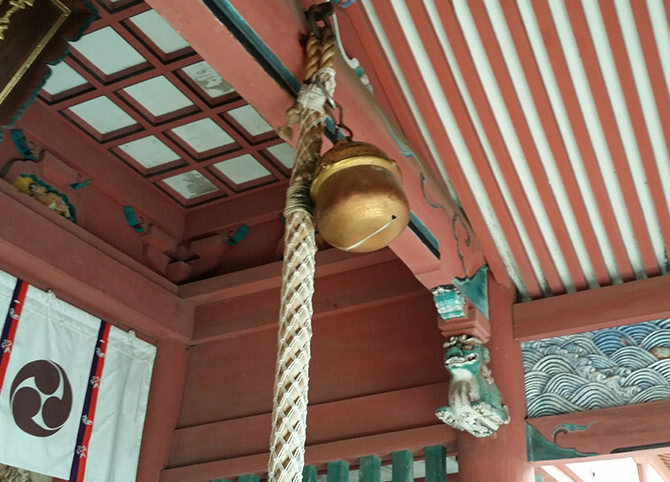 Ringing the shrine bell is a greeting to the gods, but it also purifies the spirit of the supplicant. Feel the texture of history. What thoughts does it engender? 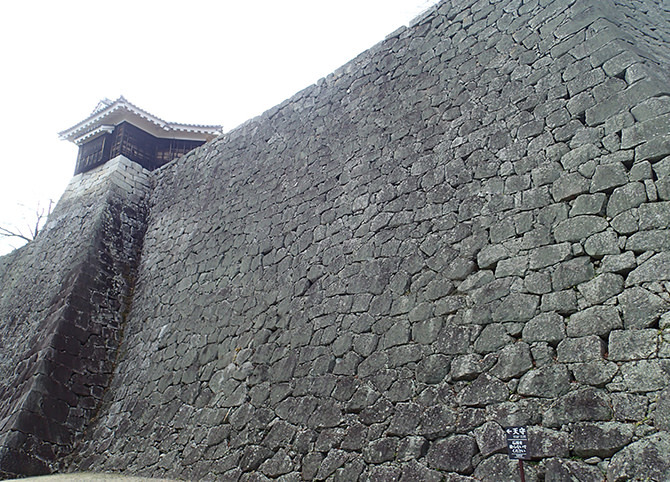 The walls of the castle remain as they were when it was built. Enjoy the look and feel of the real thing, dating back 400 years. In the past, warriors trod this path. Enjoy the feel of the weather-beaten wooden pillars and doors. 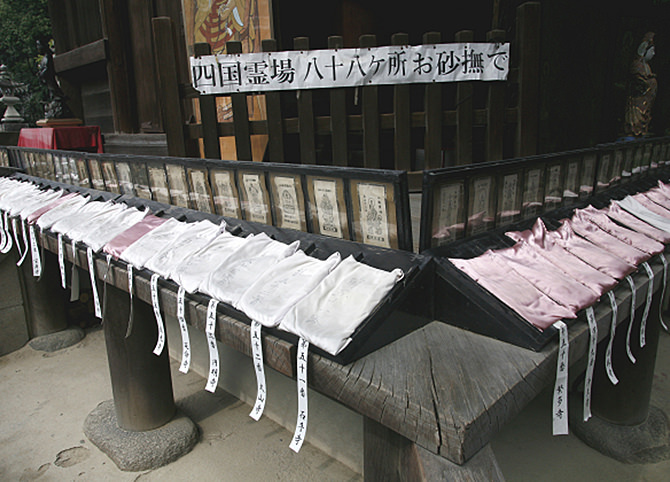 Soil from all 88 Shikoku Pilgrimage temples is gathered here. 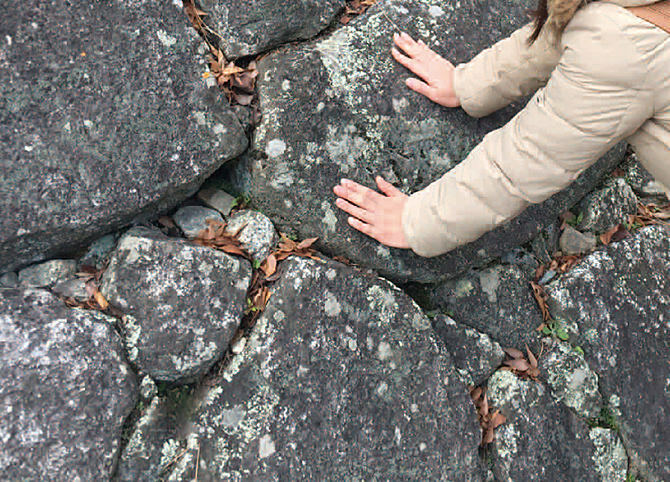 By touching the soil and praying, you can receive the same blessings as if you completed the pilgrimage. The feel of yukata against your skin after a bath. It’s a relaxing moment. You take your socks off and soak just your feet in the hot spring. 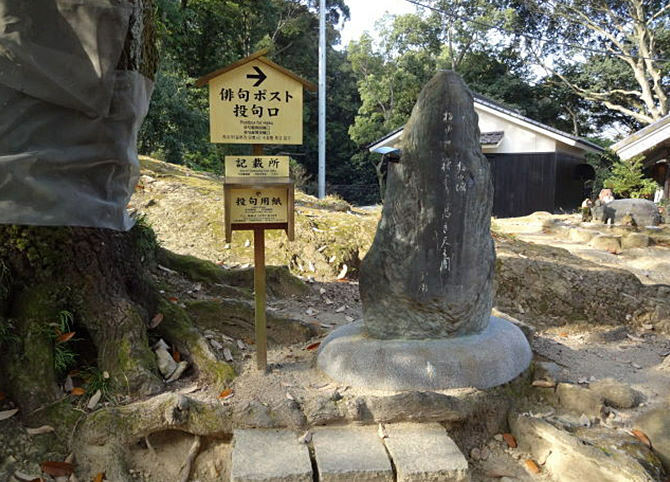 There are seven locations around Dōgo Onsen. It’s said that touching the giant straw sandals heals sore feet. Cleanse your hands before entering the temple. The cold water also cleanses the mind. 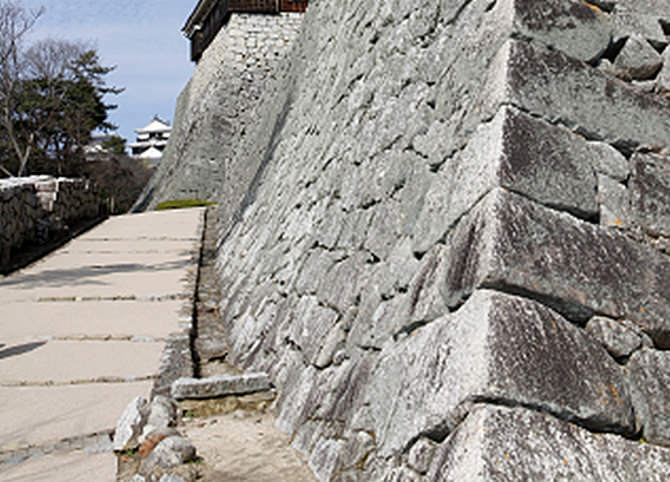 The walls of the castle remain as they were 400 years ago. 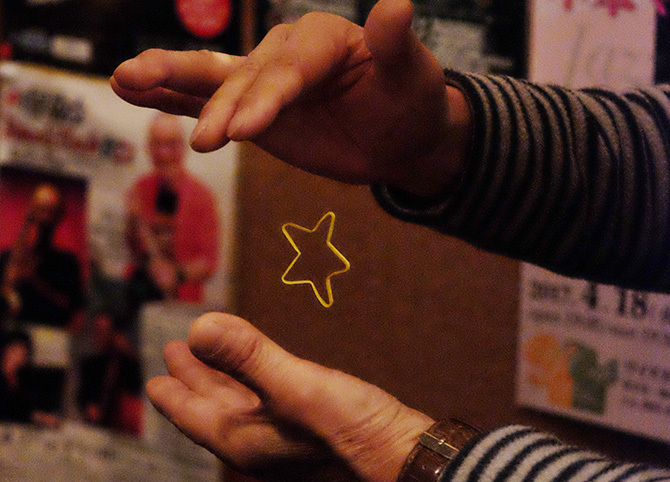 You can touch the living history. Nostalgic, pleasant and healing scents. They seem to evoke something. 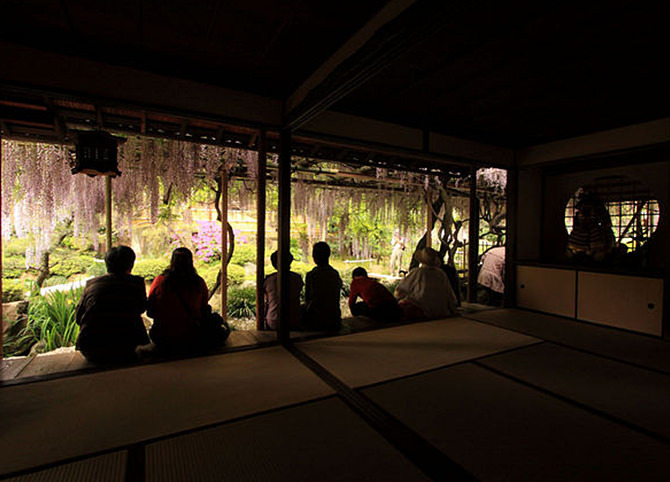 Kōshin-an was built as a hermitage for haiku poet Kurita Chodō, and today it’s used for tea parties. It’s also famous for its wisteria. This French-style château was built as a second home for a descendant of the feudal lord of the Matsuyama Domain. 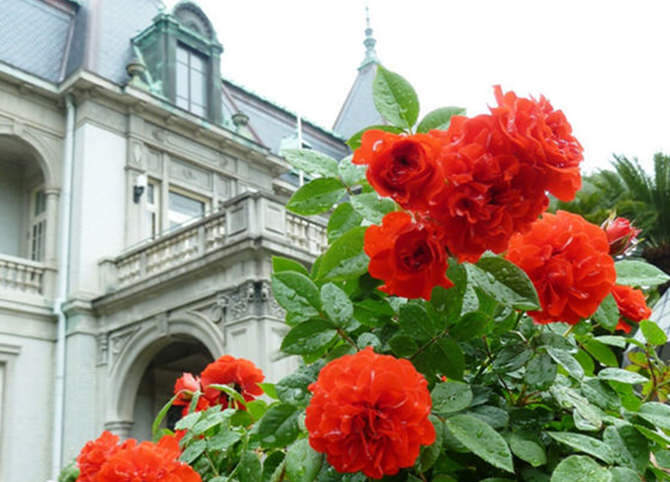 An exhibition of roses is held for seven days in May. 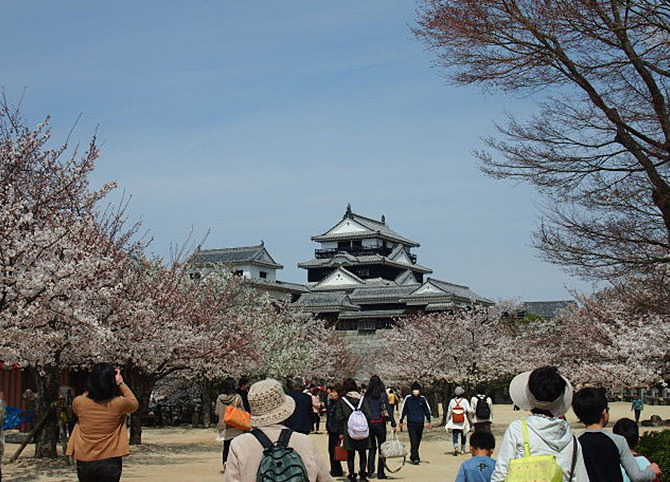 The season when people flock to Matsuyama Castle, Horinouchi, and Dogo Park to enjoy the cherry blossoms. Enjoy the drifting scent of blossom. This is the seasonal scent of the Citrus Kingdom. 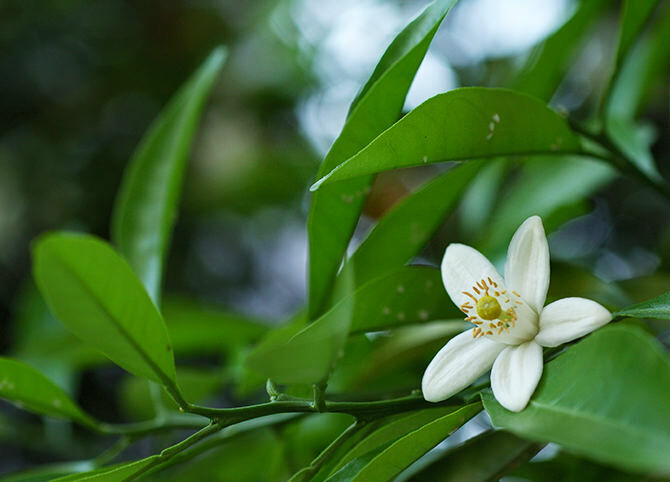 In May, the sweet aroma of citrus blossom fills the city. 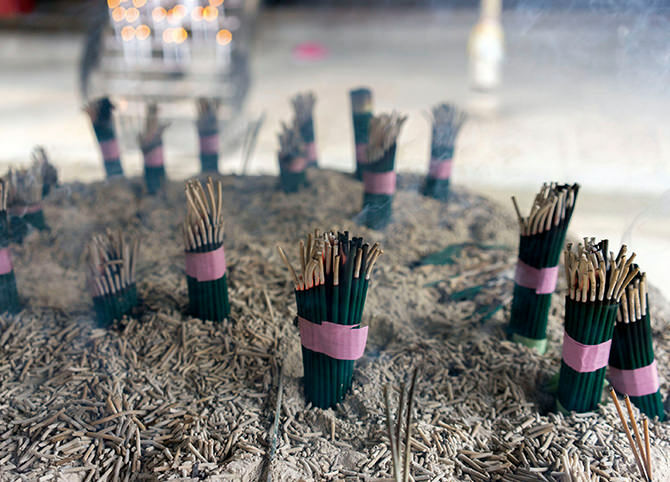 The scent of incense is said to cleanse the spirit. Beginning with an event inviting the spring, until the light of a solemn ritual. 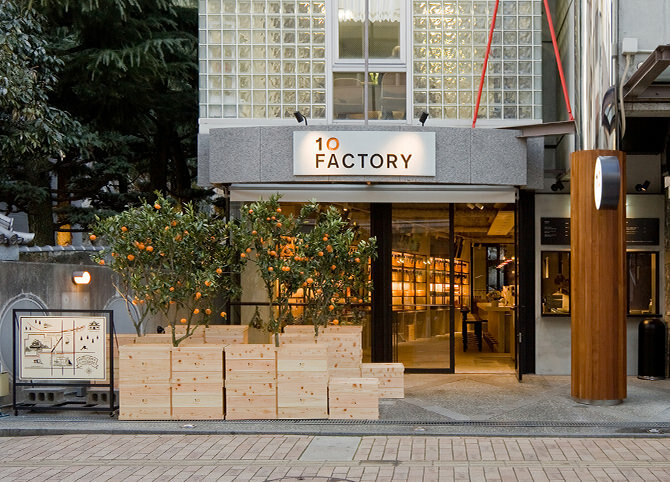 The new face of Matsuyama is also wonderful. 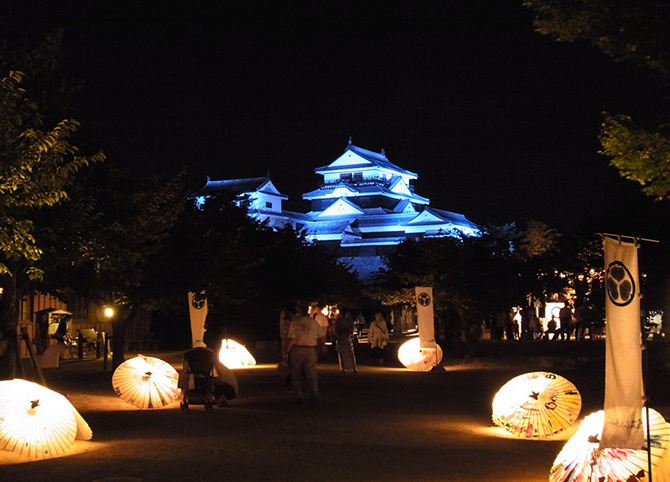 A gorgeous daimyō procession and baseball-themed dance take place around the castle. During this period, the cable car operates at night, the castle and cable car gondola are lit up, and there are many fun events. 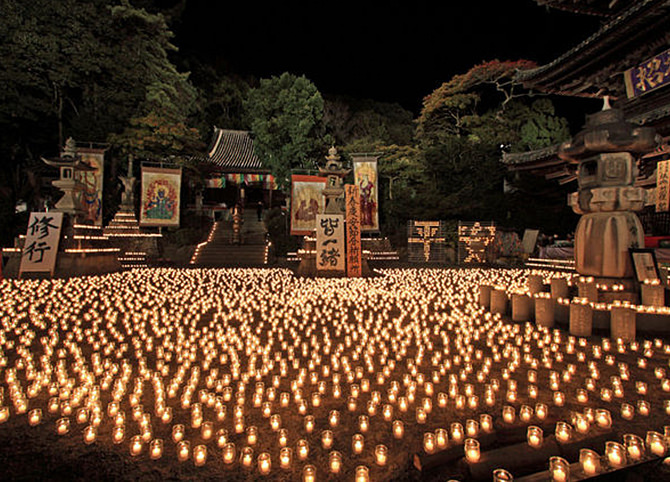 From New Year’s Eve to New Year’s Day, 5,000 lights burn as a prayer for peace. 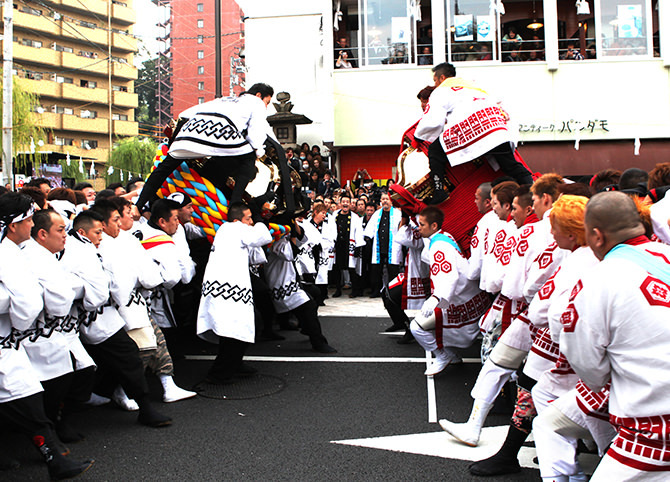 Battles between sacred palanquins take place after the bearers issue provocative calls to “Bring it on!”. 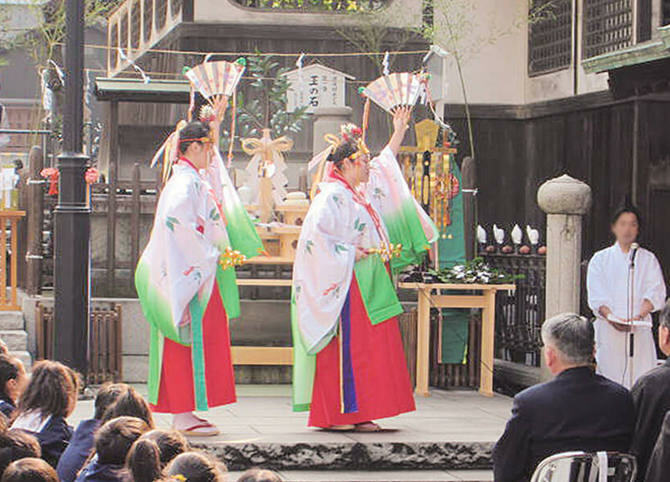 Various ceremonies and entertainments are held in Dōgo. 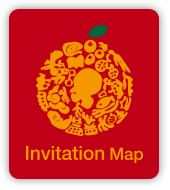 Many people visit to pray for good health. 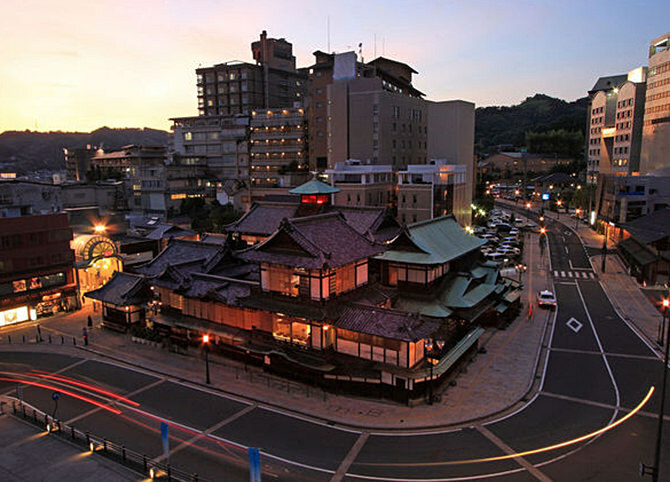 These are some of the sights in the city centre around Matsuyama Castle. Matsuyama Castle dominates the centre of the city. There’s a 360° view from the castle tower. Don’t miss the water harp. Water drips into a buried jar, creating a melodic echo. 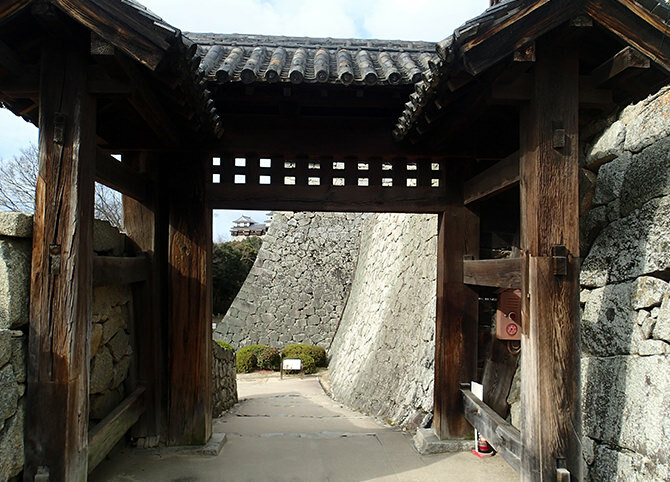 This is the site of the fortified Ninomaru Palace where the feudal lord lived. 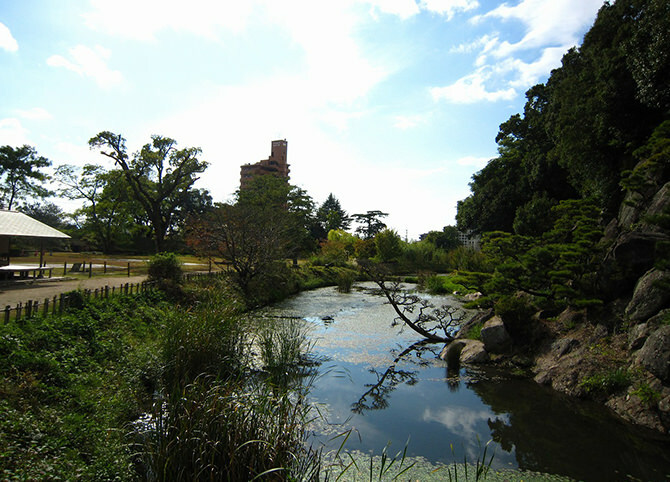 Today, it’s a historical garden. 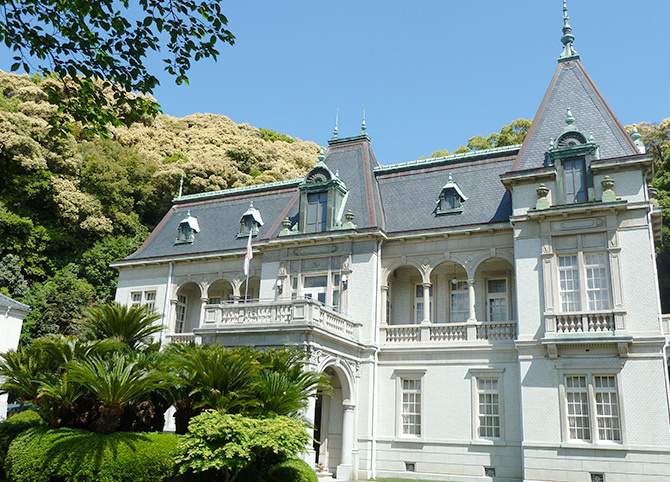 This French-style château was built as a second home for Count Sadakoto Hisamatsu, a descendant of the feudal lord of the Matsuyama Domain. 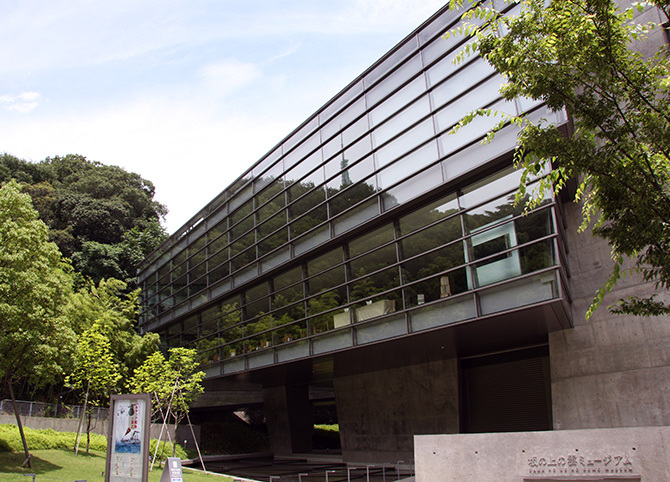 This museum focuses on the heroes of “Clouds Above the Hill”, a novel about the emergence of Japan as a modern nation. 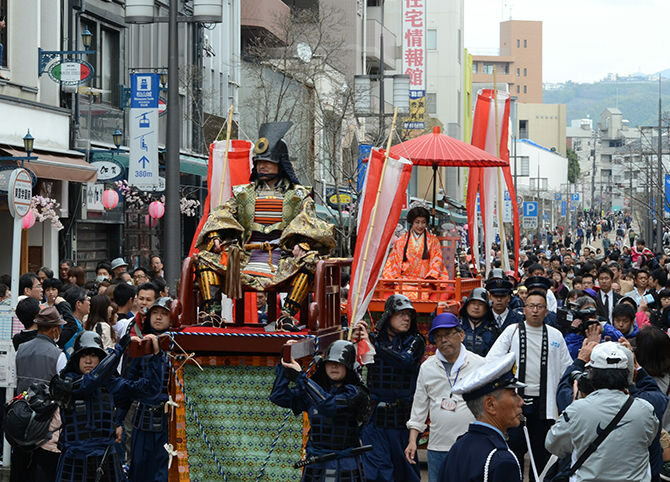 Streets packed with the produce of Matsuyama. 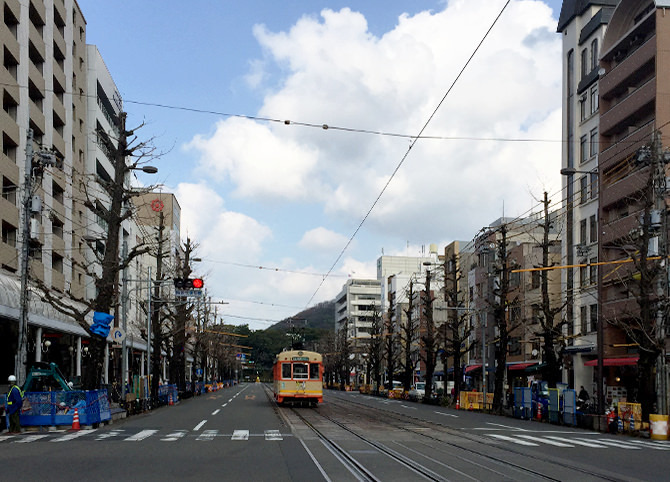 The street leads up to the cable car station for Matsuyama Castle. 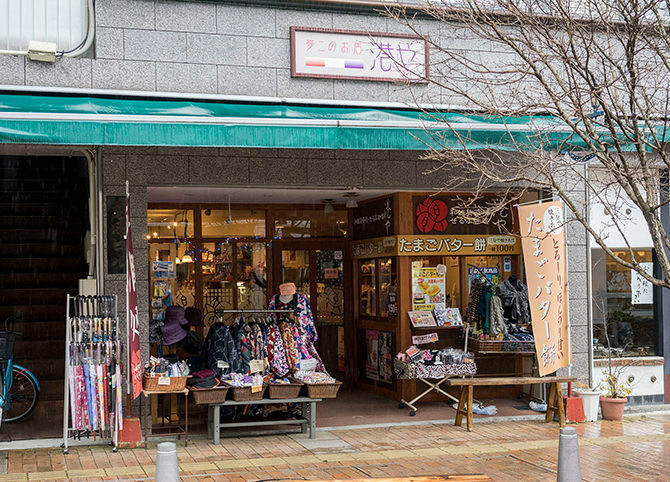 There are many souvenir shops. 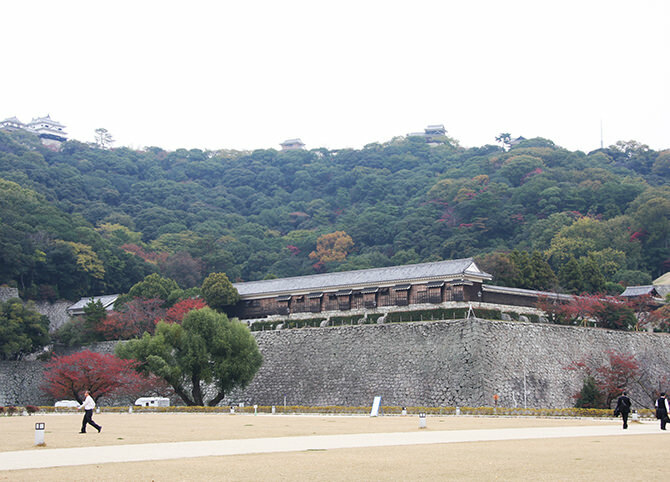 It’s the ancestral shrine of the domain, located next to the trail to Matsuyama Castle. 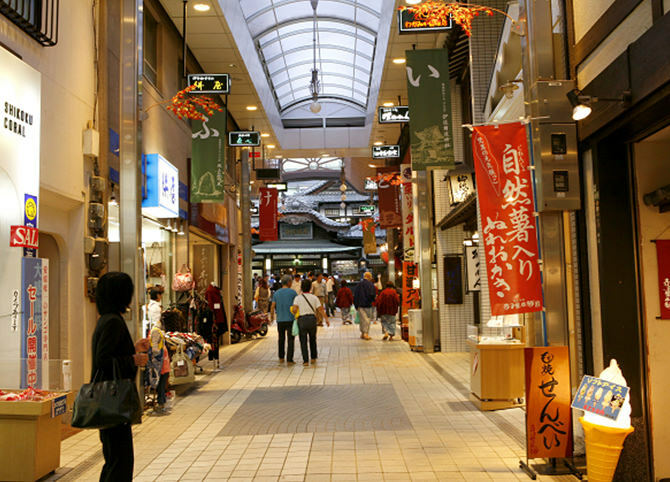 This covered arcade is the commercial heart of Matsuyama. 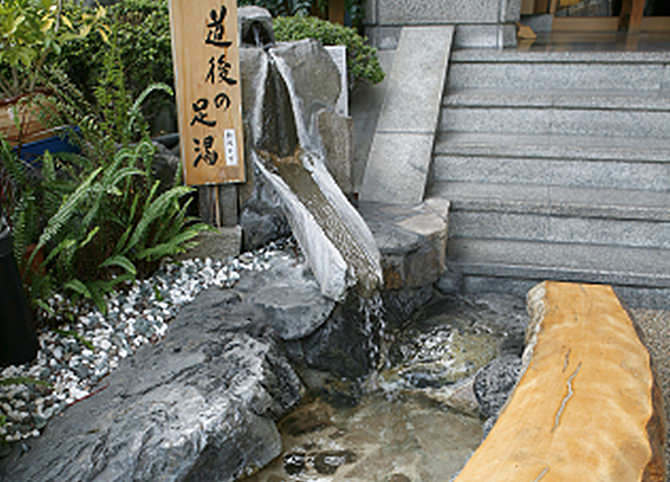 Dōgo Onsen, one of Japan’s oldest hot springs. This spot has stirred the imagination of countless visitors. Just the sight of it sets the imagination working. 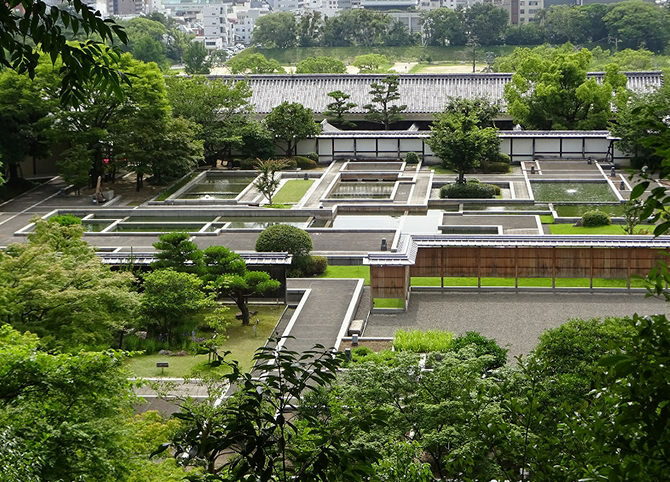 This public bath rebuilt in the Meiji period was awarded the highest rating of three stars in the 2009 Michelin Green Guide. 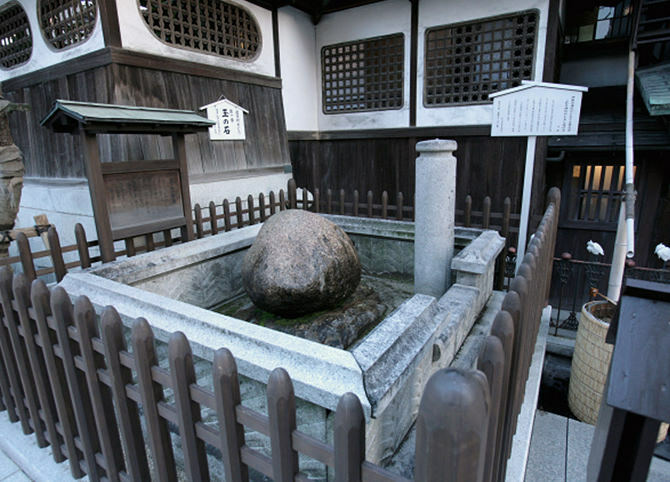 It’s said that if you pour water on the stone, your wishes will come true. Listen for the squeal of the wheels on the rails. 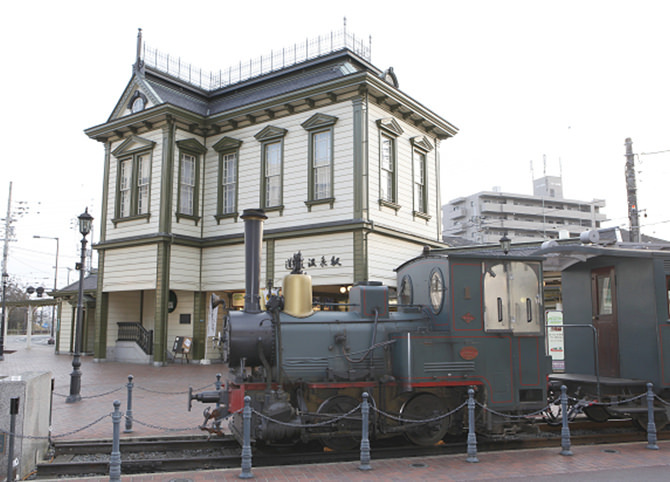 This diesel train is a replica of the steam trains of the Meiji period, which also appear in the novel “Botchan”. 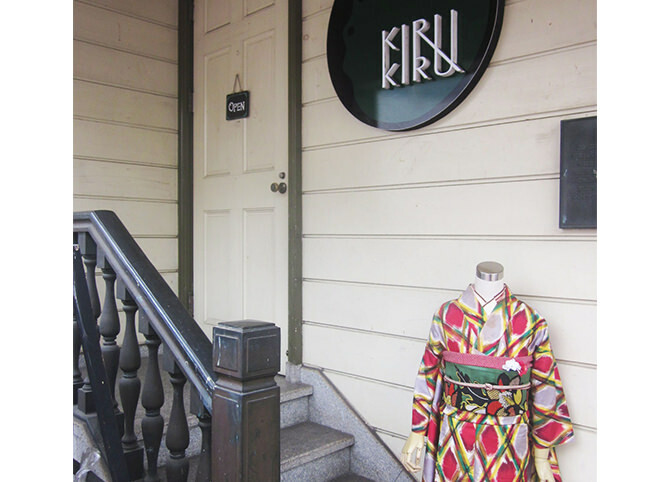 Crowds of visitors wearing yukata stroll down this street, redolent of the Meiji period. The park is the site of a medieval castle, and its moats retain their original appearance. It’s a place of rest for visitors and citizens alike. 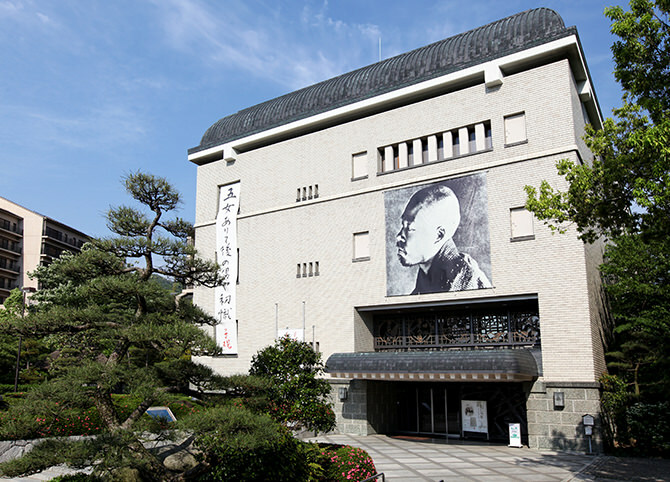 The museum holds nearly 60,000 items relating to the haiku poet Masaoka Shiki. What’s at the top of the long stone stairs? 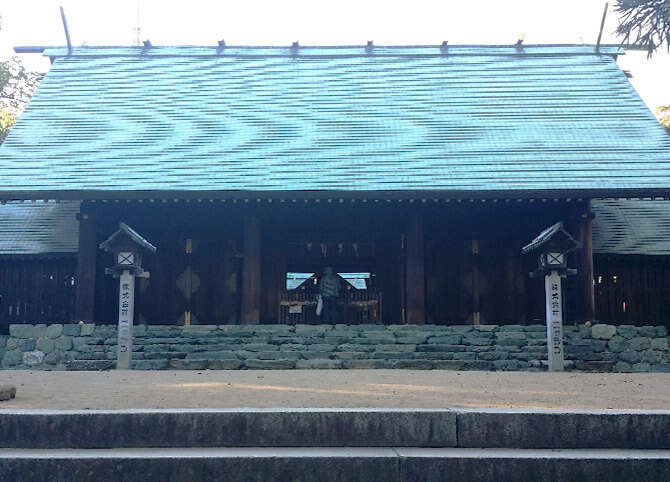 This is one of only three examples of Hachiman shrine architecture in Japan. Climb the long stairs and enjoy views far over the whole city. 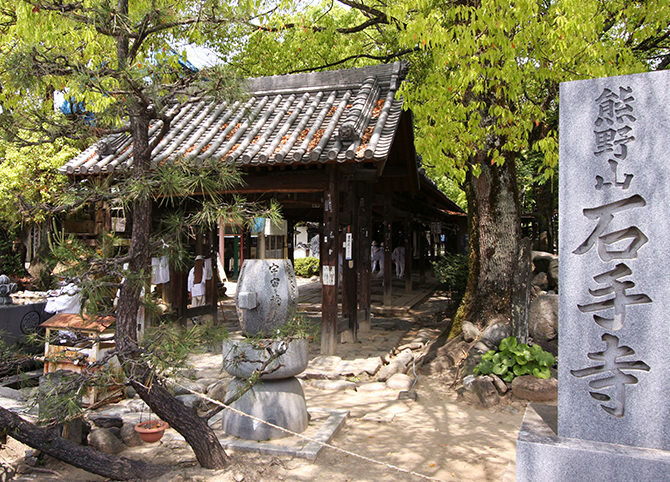 This is said to be the birthplace of the Buddhist ascetic Ippen Shōnin. 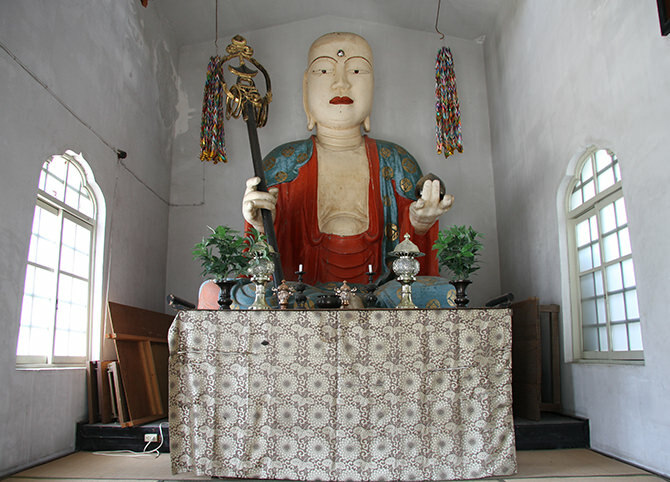 Said to protect Dōgo against fire, recently it’s also said that prayers are effective in preventing marital infidelity. 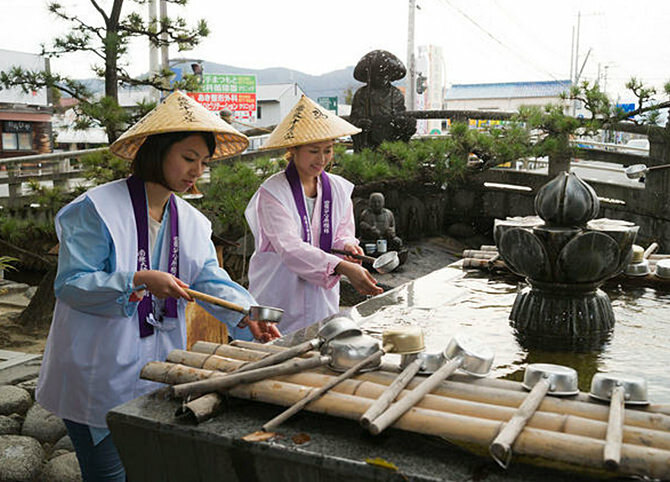 The scent of incense invites you into the world of the pilgrimage. 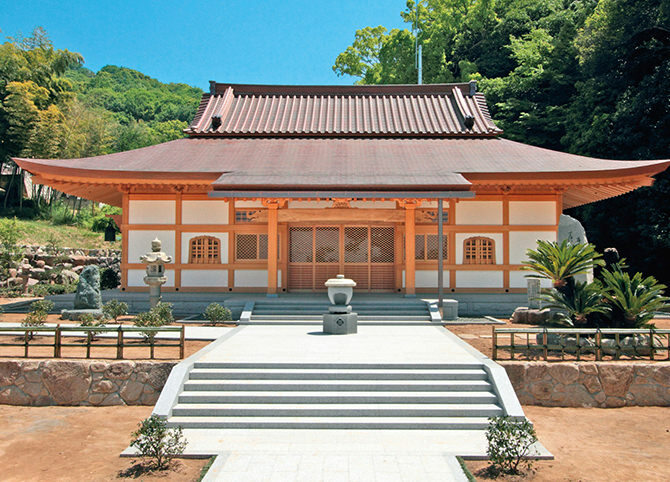 This temple is associated with the legendary Emon Saburō, said to be the originator of the Shikoku Pilgrimage. 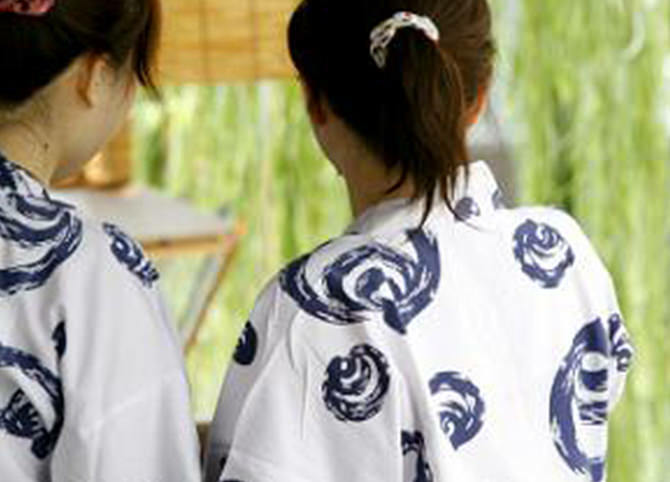 Have an expert dress you in a kimono or yukata. You can also hire the necessary footwear. If you have a little time, why not find your own favorite spot? People come and go. There’s always some drama taking place at the station. It’s the gateway to Matsuyama. 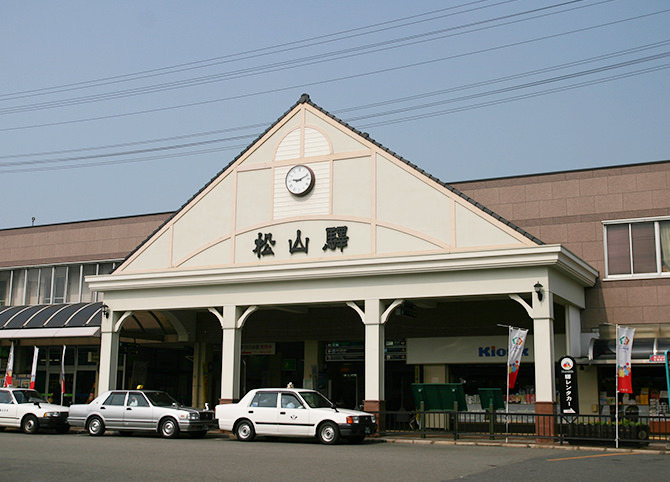 This is the Iyotetsu station. 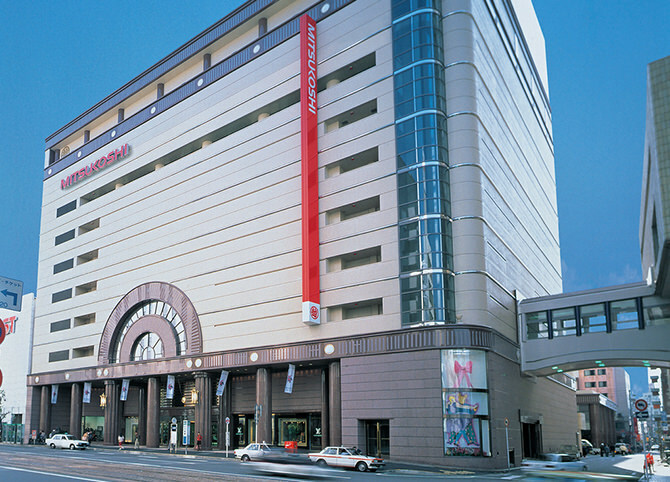 The plaza in front of the station is the stop for trams to Dōgo Onsen, buses and taxis. 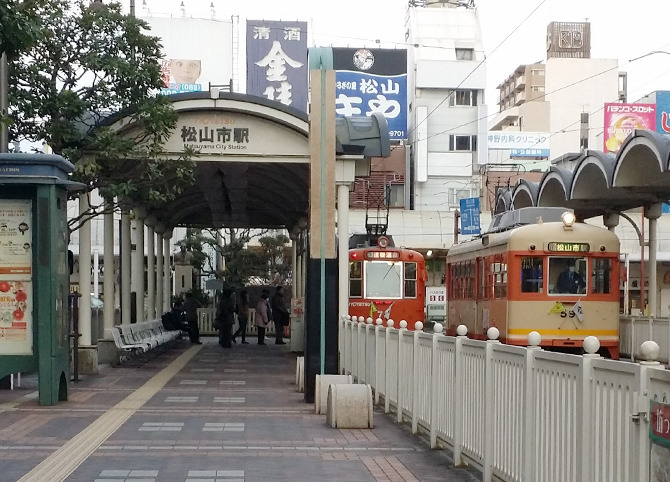 This street runs from Matsuyama Shieki Station to Minamihoribata. In winter, you can enjoy the illuminations. 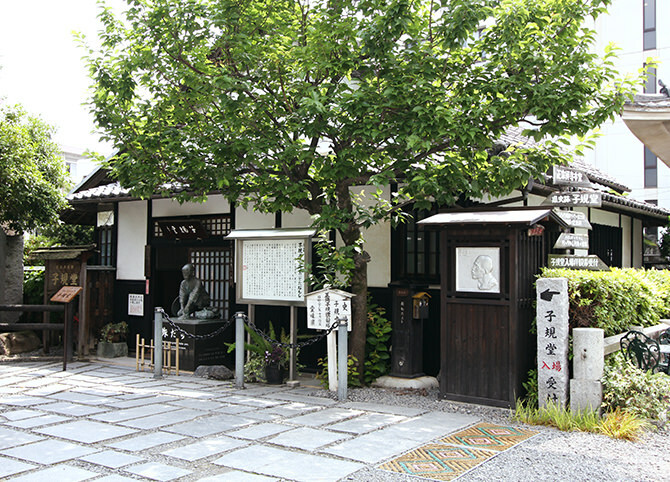 This museum recreates the house where Masaoka Shiki lived until the age of 17. Expansive lawns spread out below the castle. It’s a popular recreation spot for the people of Matsuyama. 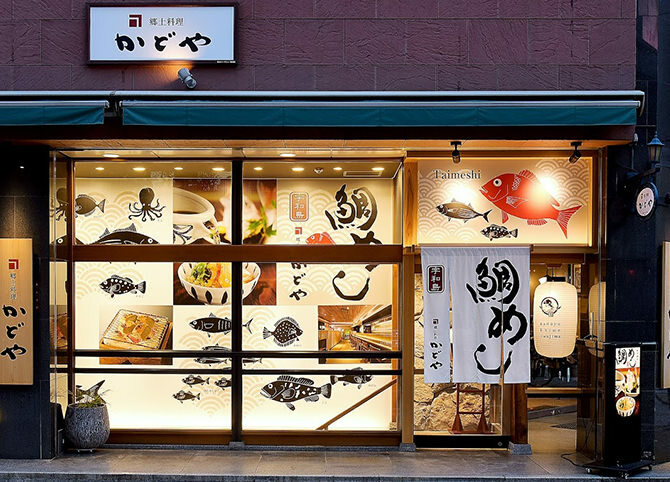 Enjoy the various flavours of Matsuyama. Enjoy lots of vegetables from farms in the suburbs. Ramen with a rich, pork-base soup. 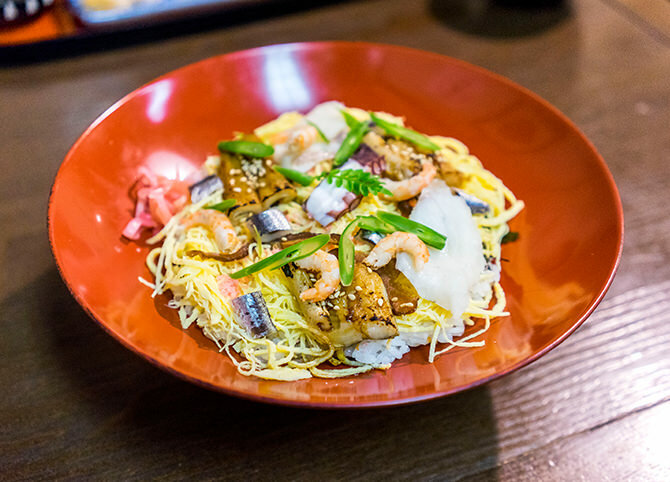 Tempura soba and a wide range of other dishes. 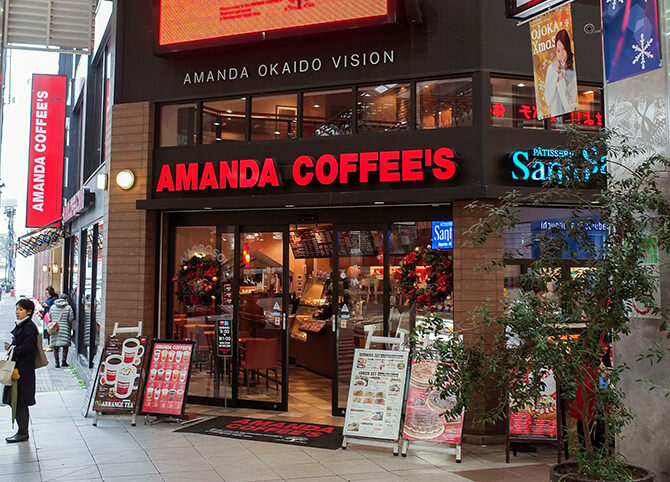 If you’re tired of walking, have a little break in a café. Coffee time watching the trains through the window. The breakfast and pancakes are popular. 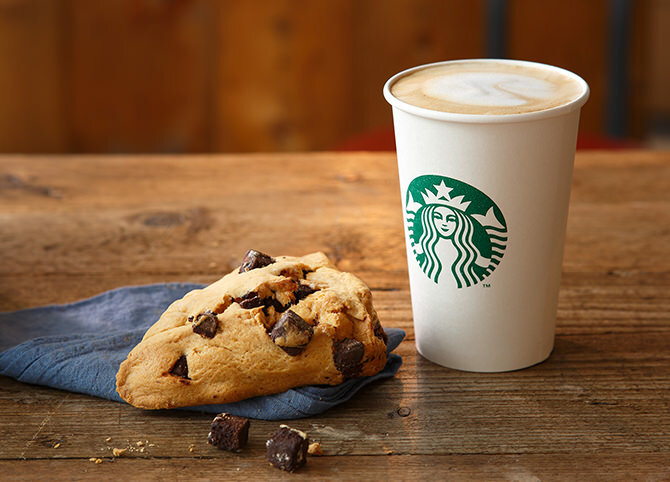 As well as coffee, desserts and lunch are also available. 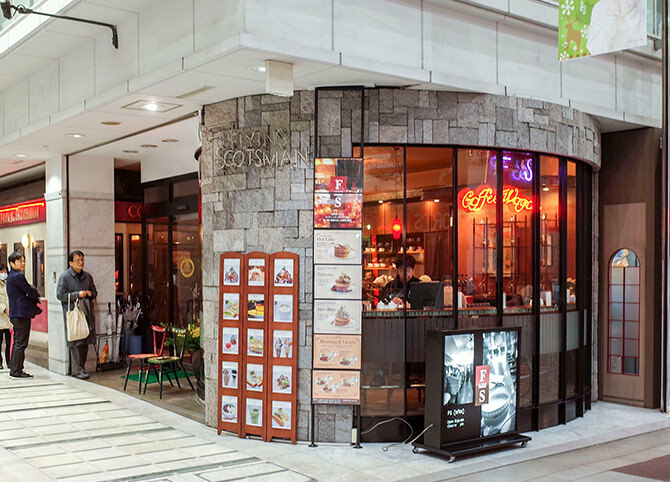 A stylish mandarin bar worthy of Ehime, the Citrus Kingdom. Gelato is also available. 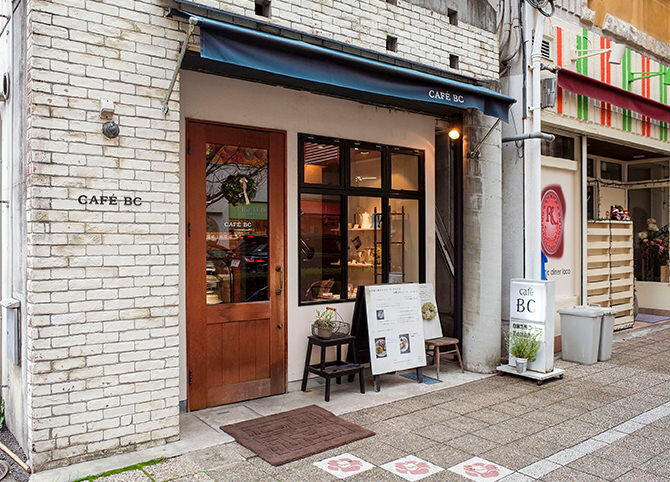 A nostalgic coffee shop with the atmosphere of the Shōwa period. Looking for souvenirs is one of the pleasures of travel. 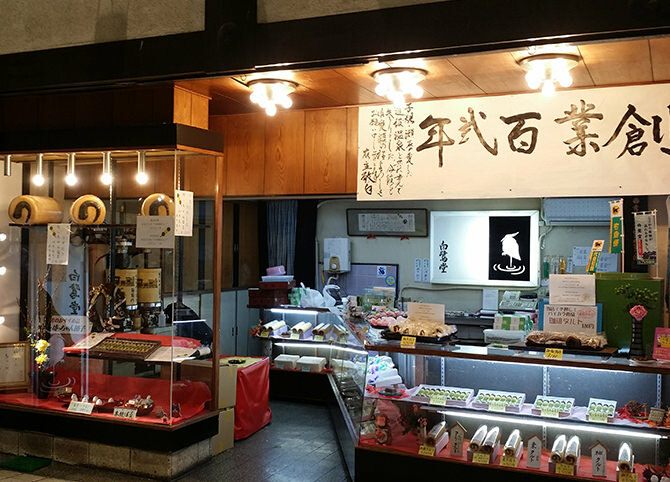 There are many souvenirs of Matsuyama to choose from. Folk crafts including Hime Daruma and toys unique to Matsuyama. The egg and butter mochi is also popular. 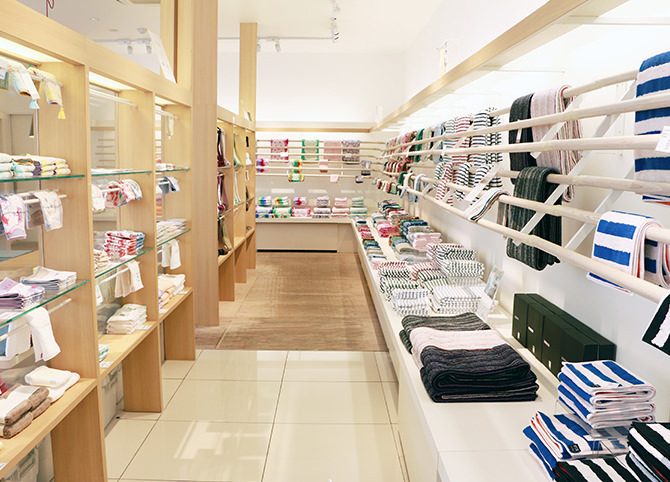 High quality towels from Imabari, Japan’s leading towel maker. 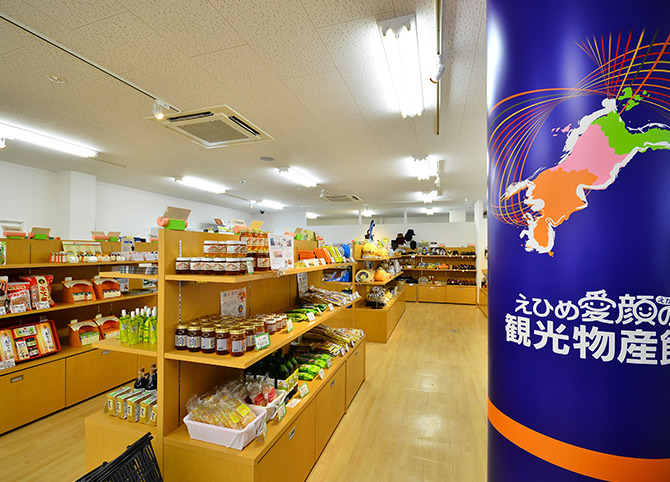 Offers souvenirs of Ehime such as taruto and Botchan dango. 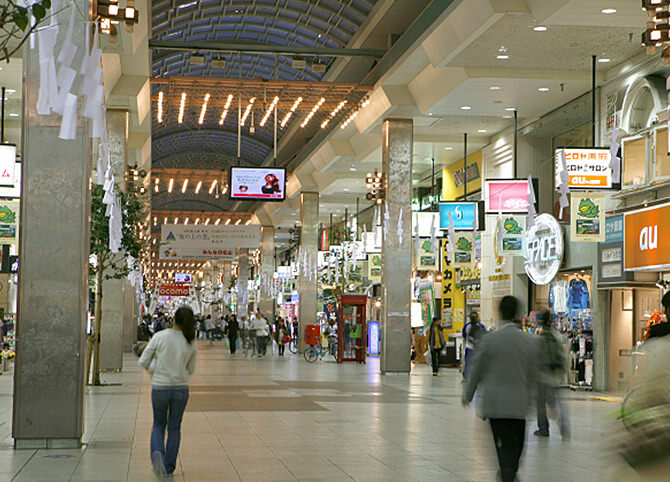 One of Matsuyama’s venerable old department stores. Steamed bread with a history going back 80 years. Cakes filled with plenty of adzuki beans.